The UK CONCRETE Show is the UK’s only event that is totally dedicated to the CONCRETE Industry! It’s grown to be Europe’s largest specialist concrete event and is attended by specialists from all over the world. If you want to see everything that’s new in the concrete industry, this is the place to be! 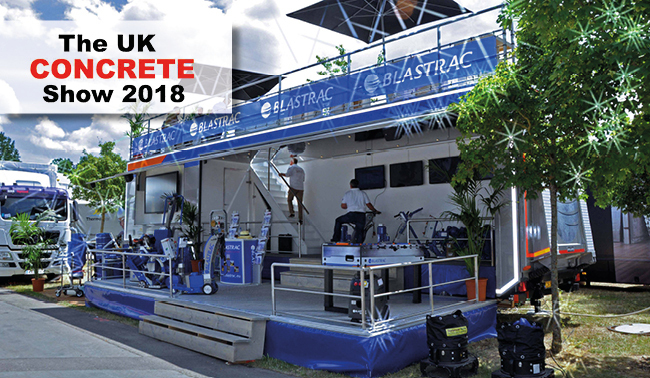 This year Blastrac will be using its promotional trailer to showcase its equipment. It’s the perfect place to talk about how Blastrac can help your company whilst having a drink. Come and visit us in Hall 18 – Stand F41! You will have the opportunity to see our latest products and our team of experts will be on hand to discuss any questions you may have.